I have only recently taken notice of the new-ish beauty hall in my local Marks and Spencer. Traditionally I would've rushed there to buy some lily of the valley something or other or similar for a gift for my mum. But I wouldn't have considered paying premium prices for make up products. This time though I was pleasantly surprised. The new Marks and Spencer beauty hall stocks several ranges including their own Autograph brand. But it was the diego dalla palma range that really caught my eye. Perhaps it was the stylish minimalistic monochrome packaging or the sharp lines of the chunky lip glosses. (Muji acrylic storage containers have the same effect on me - I don't know why it's just a personal aesthetic thing!). Diego dalla palma is an Italian brand from Milan, which started in the 1970s. To be honest this is the first time I have come across it, but a little internet digging has shown that some of their products are well known and stocked elsewhere in the UK such as Debenhams. Specifically it was the lip glosses that really caught my eye. 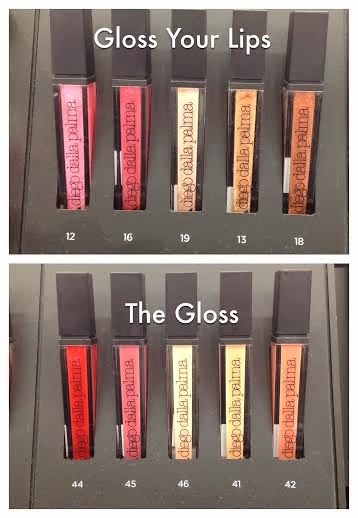 There were two gloss ranges on display; Gloss Your Lips and The Gloss. I got quite swatch happy testing them all out. The Gloss Your Lips glosses have an iridescent shine where as The Gloss glosses are shiny but rich in colour and have a lip plumping effect. Personally I prefer the effect of The Gloss range as I'm not keen on frosting or sparkle on the lips. (The Marks and Spencer website has an additional colour 43 - Burned Brown, which was not on display in store but you can see it here). Both glosses claim not be sticky and indeed they did seem to set to more of a waxy feel. I'm actually not usually a big gloss fan as I can't bear getting your hair stuck in your lip gloss and the colour completely disappearing after one sip of a drink. But those that set seem to have greater longevity on the lips and I find these tempting. These are purely glosses though rather than a gloss that leaves a stain behind. 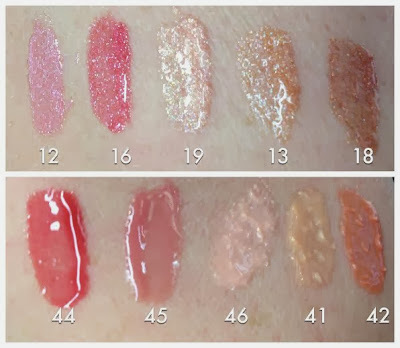 My two favourites were 46 - Milky Rose and 42 - Natural Skin Pink from The Gloss range. Both are quite natural tones with 46 a paler natural soft pink and 42 a warmer my-lips-but-better colour. I am also really drawn to 45 - Mauve which was a nice pinky plum. Although I think mauve is a misleading description as it was actually a warmer colour than that. At £14 these are at a high-end price point in line with my beloved MAC. So I am keeping an eye on these to hopefully pick a couple up after Christmas should there be any beauty discounts. You can find the full range of diego dalla palma cosmetics online at Marks and Spencer here. You can also buy directly from the diego dalla palma website here as they do ship to the UK, although the prices do seem to be a few pounds more expensive. Have you tried these or any of the other diego dalla palma range? Are they worth the premium price? I would love to hear your thoughts and recommendations.